My name is Maya Jaggi. I am an award-winning british cultural journalist and critic in London with more than 25 years’ experience of writing for the Guardian, Financial Times Weekend, Economist, Newsweek and other leading global news media. For over a decade I was an arts profile-writer and book critic for the Guardian Review, after eight years on the editorial staff of the Guardian’s international news desk. I have reported on culture from five continents and interviewed hundreds of eminent or emerging figures across the arts, including 12 Nobel prizewinners in literature. In 2017 I led the Eu-Eastern Partnership Programme’s pilot training course of cultural journalism workshops in Georgia, Moldova and Ukraine as the senior expert. This is my introduction to just some aspects of professional cultural journalism. 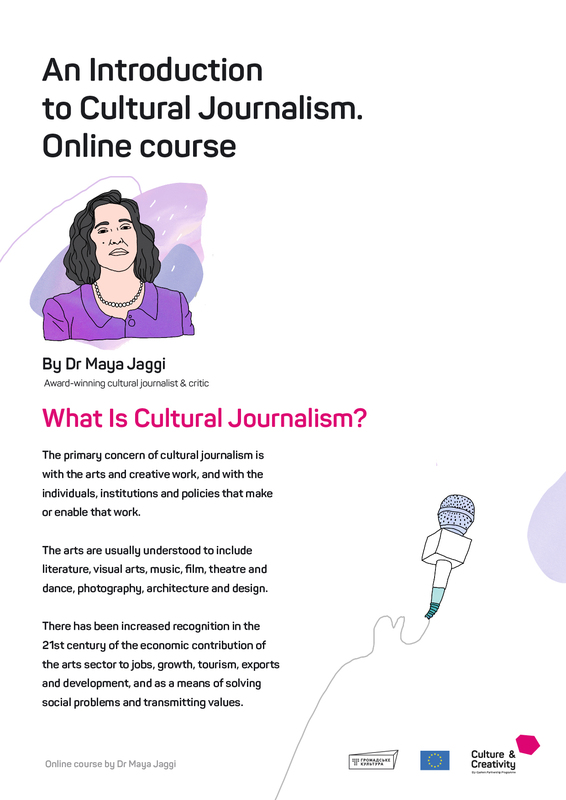 What is cultural journalism? The primary concern of cultural journalism is with the arts and creative work, and with the individuals, institutions and policies that make or enable that work. The arts are usually understood to include literature, visual arts, music, film, theatre and dance, photography, architecture and design. They cover both ‘high culture’ (many of the traditional art forms) and ‘popular culture’ (once known as folk art). Culture also extends to mass entertainment in the form of popular films, radio, television and computer games. A broader definition might include everything from gardening and gastronomy to urban planning and innovative tech startups. The concerns of cultural journalism have expanded as our understanding of culture and its role in society has developed. Some of the thinkers who have developed this understanding in new directions are Edward Said, George Steiner, Umberto Eco and Stuart Hall. We now speak about ‘culture wars’ and ‘cultural shifts’ that drive political and social change. There has been increased recognition in the 21st century of the economic contribution of the arts sector to jobs, growth, tourism, exports and development, and as a means of solving social problems and transmitting values. The ‘cultural and creative industries’ include traditional arts, applied arts and creative innovation. The EU also recognises freedom of expression, including artistic expression, as important for the promotion of individuals’ self-fulfilment and autonomy, and ‘essential for the development and manifestation of individuals’ identities in society’. Some people, including many artists themselves, prefer to emphasise the intrinsic value of art, rather than its economic or social benefits. Yet the economic arguments can help make the case for public resources and policies that benefit the arts, as well as for media coverage that can influence policy makers and build audiences for the arts. Partly in recognition of this economic value, cultural coverage in the news media has expanded beyond Arts & Literature, or Culture, sections into News, Business, Comment & Opinion, Travel and Lifestyle.